Just like that random girl who was asked to leave the Mean Girls auditorium intervention, I have a lot of feelings. These feelings typically revolve around my disdain for Nutella, Jennifer Lopez’s incredible beauty and/or dancing naked in the moonlight. I didn’t even think it was possible for me to develop more feelings but it’s happened and I’m not sure what to do about them. See, I’m a man on a budget but I’m inspired by this autumn weather we’re experiencing and all I want are boots. I’ve developed feelings for boots! It’s going to make me an unbearable wretch to be around but the only solution I can think of is to skip lunch for about a month in order to satiate this fairly unbearable appetite of mine. That might sound fairly ludicrous to you but, gentlemen, listen up. You will never go wrong with having a good, sturdy boot on standby. Science blogs (they do exist) say so which means it’s 100% fact so just go with it. Better yet, go with this brown leather Chelsea boot ($160) from Topman. 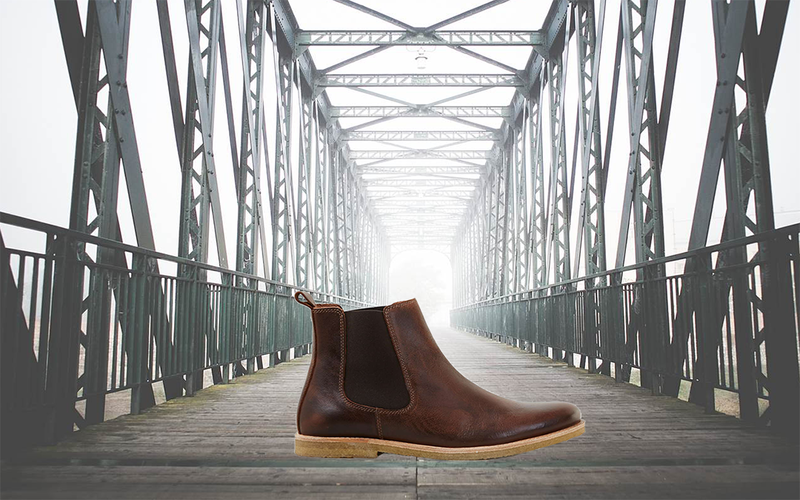 It’s pictured on a bridge of sorts above because, well, bridges signify some type of crossing over and what better way to cross over in than a pair of stylish boots?